← Barbara Claypole White. The In-Between Hour. Don Mills, Ontario: Harlequin Mira, 2014. Elizabeth Craig. Knot What It Seams. New York: Signet Books, 2013. No matter how hard she tries, it seems like Beatrice Coleman is never able to relax. Try as she might, just as she gets comfortable, something always seems to get in Beatrice’s way – a phone call, her eccentric neighbor, Meadow Downey, dropping in unexpectedly, or, even worse, a murder. Beatrice thought a cottage in Dappled Hills, North Carolina would be a nice, sleepy little place to spend her retirement. Turns out, she was wrong. Meadow, the leader of the local Village Quilters guild, is bemoaning the recent decline in membership. She is fanatical about nipping the trend of dwindling attendance in the bud. She informs Beatrice that she has invited Jo Paxton, formerly of another area guild, the Cut-Ups, to join the Village Quilters. Beatrice is wary of the prospect of welcoming Jo to the group, especially after she observes two heated interactions between Jo and members of the Cut-Ups at the Patchwork Cottage, the go-to shop for quilting materials in Dappled Hills. The Cut-Ups kicked Jo out of the guild because she is a narrow-minded bully who only appreciates traditional quilting. Her confidence in her opinion is only reinforced by the fact that she judges for several quilting shows. But Meadow is dead set on extending the invitation, despite Jo’s tendencies to cause trouble. From her very first Village Quilter’s meeting, know-it-all Jo critiques each of the quilters’ work, one-by-one. In the midst of inviting Jo to the Village Quilters, both quilting guilds are taken aback by the news that Mayor Booth Grayson intends to tax the quilting groups. Since the guilds are generating revenue, Grayson has decided to tax them for the benefit of the town. All the quilters dispute the decision since the bulk of the money they raise is donated to charity. During the town hall meeting, Jo picks a fight with Mayor Grayson, threatening to air his dirty laundry if he doesn’t drop his plan to tax the quilters. Jo is also the town mail carrier, and a very bad one at that. She constantly delivers mail to the wrong addresses and is known to snoop through other people’s post. Police Chief Ramsay Downey manages to diffuse the tension by suggesting that Mayor Grayson will attend the upcoming quilting show before he reaches a final conclusion on taxing the quilters. The night of the quilting show, Jo doesn’t show up. The quilters learn that in the rainy weather, Jo drove her car off the side of a mountain in a car accident. Beatrice suspects fowl play and she urges Ramsay to investigate further. Many of the town people are struggling to display grief in response to Jo’s startling death. After a bit of nudging, Ramsay discovers that Beatrice’s instincts were correct. Jo’s unfortunate car accident was no accident–someone cut her brakes. With a murderer on the loose, the town of Dappled Hills is left reeling. Contrary to her mission to relax, Beatrice winds up collecting clues and investigating Jo’s murder, but this isn’t an easy case. So many people wanted Jo dead for very different reasons, from her husband Glen Paxton, a mechanic, to Karen Taylor and Opal Woosley, slighted Cut-Ups members, to Mayor Grayson. Beatrice better take care that she doesn’t get too hot on the trail of the killer, lest she become the next victim. 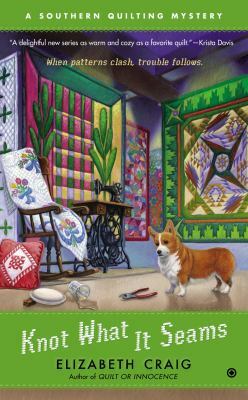 Novelist Elizabeth Craig returns with her offbeat band of characters in this second installment of the A Southern Quilting Mystery. Craig, a cozy mystery novelist, writes an absorbing mystery for readers who like the gruesome elements of a story toned down. “Cozy mysteries” feature an amateur sleuth who lives in a tight-knit small town. The focus is shifted away from the unpleasant details of the murders themselves and onto the detective work, the sleuth’s personal life, and the recurrent characters, or rather townspeople. Read more about cozy mysteries here and here. Knot What It Seams is an exemplary model of the sub-genre. As the name “cozy” implies, there’s much more humor and light-heartedness in Craig’s work than the average mystery. She even includes quilting tips and recipes at the end of the book. If you’re interested in starting with the first novel in the series, Quilt or Innocence, take a look at our blog post on it here. Check this title’s availability in the UNC-Chapel Hill Library catalog.